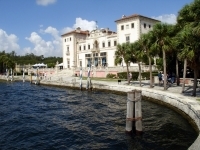 Lovers of antiques will enjoy visiting the magnificent 34-room Vizcaya bayfront villa, built in the Italian Renaissance style in 1916. The grand mansion took hundreds of artisans five years to complete, and the formal gardens, which surround the villa fronting on Biscayne Bay, took even longer to lay out. Today visitors can tour the villa and grounds, enjoying the original furnishings and décor in a variety of Renaissance, Baroque, Rococco, and Neoclassical styles. Vizcaya Villa gives visitors a taste of the best of Europe right in the heart of Miami. Opening times: Daily (except Tuesdays) 9:30am-4:30pm. Admission: $18 adults, $6 children, other concessions available.